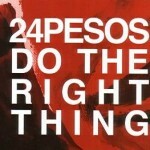 Share the post "Album review: 24 PESOS – Do The Right Thing"
‘Do The Right Thing’ is the fourthalbum by 24 Pesos and it’s another step-up for a fiercely independent band that has forged its own niche by riding roughshod over musical expectations. All their trademark elements of deep funky grooves, burning solos and passionate vocals flesh out the title track, which is a template for the album both musically and thematically: ‘I really hate convention, times I try to change, the remedy that I can see gonna save me from my ways, but I try, try to do the right thing’. And they do the right thing by creating their own musical landscape. They draw on soul, funk, R&B and blues to light the fuse with the kind of intense solos that gives the title track its edge. ‘Do The Right Thing’ is a live in the studio album framed by an intuitive production that captures the band’s spark, emphasizes the solos and nails their grooves. Whether by oversight or by design, they fail to give any individual credits either on their Facebook or website page. Given their music is a joyous composite of the contributing parts it’s perhaps a subconscious nod in the direction of the organic whole. As with their previous album ‘When The Ship Goes Down’, everything is anchored by the excellent drummer Mike Connolly and the bass playing producer Silas Maitland, both of whom understand the push and pull and feel function of a rhythm section. This gives the harp playing guitarist and songwriter Julian Burdock room to burn, while Hammond player Moz Gamble glues the fat grooves together and gives them a broader vista. There’s not a weak link in a band that brings its own unique feel to muscular funky material. They are a song driven blues band with real substance who refuse to be constricted by labels or an industry built on formula and cliché. Their deep rooted funky style is evidenced by opening descending bass line of ‘Step Back’, on which Julian’s soulful vocal soars above a bristling arrangement as the band bursts through the cracks. They get low down and funky on ‘Wont Lie Down’ to evoke the white boy soul of Robert Palmer and they further explore a slide-led funky groove on the booming ‘The Good Lord Did’ which generates the excitement of their live shows. The subtle slide playing and funky wah-wah undertow of ‘Rise Up’ cleverly evokes the song’s title and the middle of the album is given a lift by ‘Clap Hands’ which is a catchy stomp. Julian switches to stripped down acoustic mode on the delightful harmony vocals of ‘Need Somebody’ and he adds a stream of consciousness rap on ‘Midnight Train’, with lyrics that reflect the survivors instinct of the title track: ‘So sweet nothing was finer , until the notes changed from major to minor, this town had me on the run, what ever happened to that crazy young gun, I feel low down low, a foot down, head straight for the wall, had to learn not to crash and burn yeah, everyday blows away, hey you, you got to get your head out of the dirt’. Julian’s phrasing and Dobro playing meld perfectly over a pounding rhythm track which distils the band dynamics perfectly. He’s at his most soulful on ‘If You Want It’ and adds an unexpected harp line over a heavily accented track, while the swaggering shuffle ‘Boom Boom’ sounds like a natural set closer and rounds things off with wailing piercing wah-wah guitar solo and a final Hammond flourish. This entry was posted in ALBUM REVIEWS, ALBUM REVIEWS (Mobile), All Posts and tagged 24 Pesos, album, blues, Do The Right Thing, funk, Julian Burdock, Mike Connolly, Moz Gamble, R&B, rap, review, Robert Palmer, Silas Maitland, soul. Bookmark the permalink.